add a lastest announcements block. 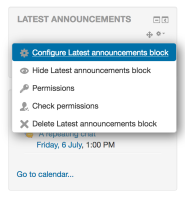 click the actions cog on the latest announcements block. scroll throught the options in the pop up menu. cross check only the first entry has rounded edges at the top corners and the latest entry has rounded edges at the bottom corners. test in clean. create a course. turn editing on. add a lastest announcements block. click the actions cog on the latest announcements block. scroll throught the options in the pop up menu. cross check only the first entry has rounded edges at the top corners and the latest entry has rounded edges at the bottom corners. This is regarding the new(-ish) menu that pops up on blocks to let you configure/hide etc. it. One of the styles, intended to give rounded corners on the top of the first item and the bottom of the last item of the list is wrong, and instead puts rounded corners on each item by mistake. That's saying round the top of the first "a" tag in any div in the menu, but actually it should say round the top of the (only) "a" tag in the first li and so on, so we want "li:firstchild a" instead.